Call Center manager wins Miss Gay Puerto Princesa 2018. Sitel operations manager Antwon Sanchez was crowned as this year’s winner of the returning Miss Gay Puerto Princesa. A call center manager who said the essence of Miss Gay pageants is allowing them the freedom to express themselves and to share their happiness and blessings to others was crowned as this year’s winner of the returning Miss Gay Puerto Princesa (MGPP). After a six-year hiatus inside the world of gay beauty pageants, the MGPP was back at the People’s Amphitheater in Mendoza Park on December 19 to bestow the crown to 30-year old Sitel operations manager Antwon Sanchez. The gay pageant’s comeback highlighted the month-long festival Pistahan 2018 in Puerto Princesa City and marked the end of the long-term reign of MGPP 2012 winner Helena Cueva. Her answer to the question “How significant are gay pageants nowadays?” won the hearts of the judges and the crowd that packed the amphitheater to witness the revival of the MGPP. MISS GAY PUERTO PRINCESA: (L-R) Reigning Puerto Princesa Queen of Queens Floriza Bracamonte, who won the fourth runner-up award; Sining ng Palawan member Fritz Mendez, who also won Best in Talent, is this year’s 1st runner-up, Miss Gay Puerto Princesa 2018 Antwon Sanchez; second runner-up winner Santiago Mystica, and third runner-up winner Mj Tolentino. “The significance of joining Miss Gay pageants is not only winning about winning the crowns. The objective of this pageant, which is ‘Shining and Sharing’ gives importance to the fact that we, the Miss Gay candidates are not only battling for the crown, we are also sharing our blessings to the people, we went to communities to share happiness and Christmas presents. We also want to shine because we are just beauty queens, we have a heart, we are genuine, we are confident, and we share love to people in the universe,” Sanchez’ answer said. In addition to her Miss Gay Puerto Princesa 2018, Sanchez who is a BS Nursing graduate of St. Mary’s College in San Juan City, also won the Best in Swimsuit award. When she moved to the city in 2010 due to her employment at Sitel, Sanchez gained other gay pageant titles such as Puerto Princesa Queen of the North 2017 and Gender Bender Queen 2018. As a proud LGBTQ+ (lesbian, gay, bisexual, transgender, transsexual, queer, questioning, intersex, asexual, ally, pansexual) advocate, Sanchez wants to focus in coming up with “sharing programs” for those who are behind bars. She said by visiting detained and imprisoned LGBTQ+ or those belonging to the third gender, she can share with them happy stories that can ease their agonies in penal facilities. “I want to be the ambassador of goodwill and encourage the community that we, the rainbow group, can also do things that they do not expect us to do,” Sanchez said. Sining ng Palawan member Fritz Mendez, who also won Best in Talen, is this year’s 1st runner-up, while Santiago Mystica won second runner-up. 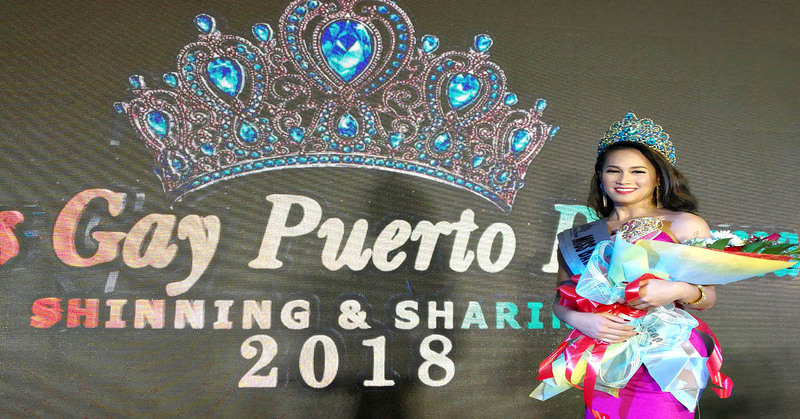 The third runner-up award was awarded to Mj Tolentino, and fourth runner-up was taken home by reigning Puerto Princesa Queen of Queens Floriza Bracamonte. Sanchez won P10,000 cash from the MGPP while the first and second runners-up each won P5,000. The third and fourth winners received P3,000 each. Non-winners each received P1,000 as a consolation prize. The MGPP’s chairman of the board of judges was Francis Castillo, a vacationing international flight steward, former Palawan State University (PSU) professor, and proud LGBT member. He was joined in the panel by Miss Palawan South 2018 Veronica Sinajon, past Miss Puerto Princesa runner-up Michelle Solomo-Valdez, jail officer Marlito Ansa, and past MGPP Queen Ella Desabayla. Miss Gay Puerto Princesa’s revival was a historical event for the rainbow people in the city as it also featured lesbian personalities who served as escorts of the candidates during the program. Past pageant winners since 1987 were also present, making the revival night more significant and memorable not only for the winners but also the organizers. Balangaw president Geofred Gabo, who organized the MGPP, also directed its entirety. Among its sponsors were restaurateur Lui Oliva of the popular Kalui restaurant and Palawan’s very own Charlene Guttierez, the Miss Gay Philippines winner in Canada in 2013.